The Tengizi Islands (also Tengiz Islands) are an island chain sited within Lake Tengiz in Kazakhstan near the Caspian Sea. The area is known to be a source of oil. The Tengizi Islands are the site of the medieval Kingdom of Tengiz, first united by King Magreb. Prior to its expansion in 2008, the Tengiz oilfield had 53 wells, tapping a column of crude oil around 1.6km thick. When the field was first tapped its oil pressure was 12, 000psi, but in 2004 the pressure came down to 10, 000psi in most areas and 8, 500psi in others. The SGI project used gas injection technology to boost the pressure and increase oil recovery, while the SGP increased the number of producers (wells) and improved and expanded the crude export infrastructure. The Tengiz field's production of crude in 2004 was 13 million tonnes per year but the SGI and SGP production increased this to over 25 million tonnes. TCO crude oil production capacity was increased by about 80% to 540, 000 barrels of crude oil, 46, 000 barrels of natural gas liquids and 760 million cubic feet of natural gas. "Chevron is operator of the Tengiz field." The two projects created over 7, 000 jobs in Kazakhstan and aided the development of the economy. A total investment of $20bn is envisaged for the duration of the 40 years of the Tengiz oil field venture. 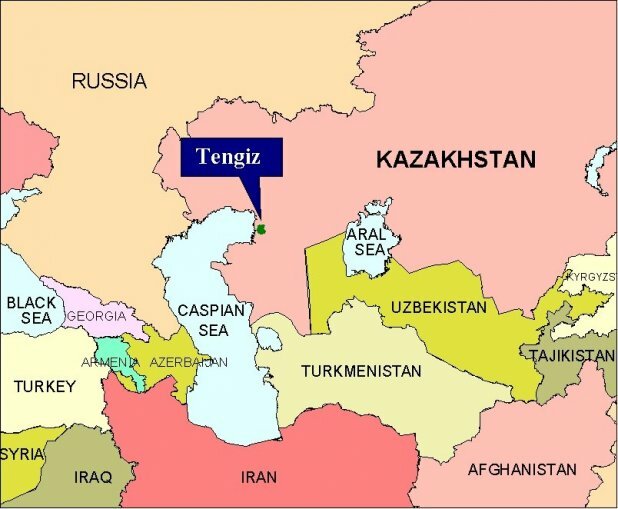 TengizChevrOil intends to export more of the Tengiz field's additional capacity via the Caspian Pipeline Consortium pipeline running the 1, 500km from Tengiz to the Russian Black Sea port of Novorossiysk (thus solving the export problem from the remote Tengiz field).